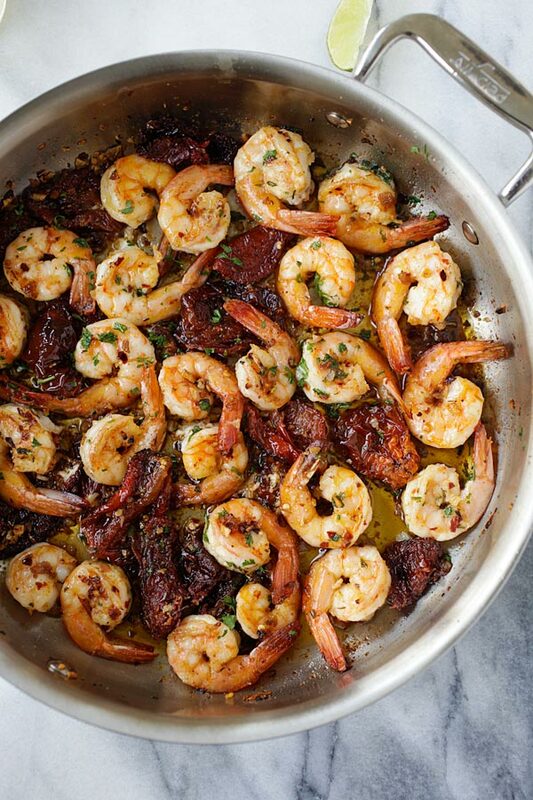 Garlic Sun-Dried Tomatoes Roasted Shrimp - Best garlic roasted shrimp recipe ever! Learn how to make this Spanish/Mediterranean dish. If you are hosting or going to a New Year’s Eve party and wish to bring a dish that is sure to impress, this garlic sun-dried tomatoes roasted shrimp is the perfect dish to make. I had this dish while we were on our family vacation at Per Aquum Niyama. It was an unforgettable dish and I have been craving for it for a while. 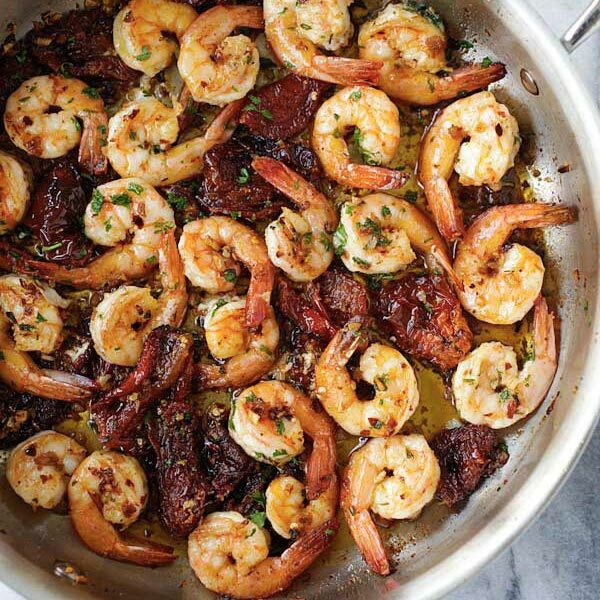 The dish is very simple; you will need lots of garlic, some sun-dried tomatoes, olive oil, parsley, chili flakes and shrimp. This Mediterranean dish is very much like the ones served at Tapas restaurants in Spain and all over Mediterranean. The sweet thing is that you don’t have to pay an arm or a leg for it, as you can whip it up in 20 minutes at the comfort of your own home. 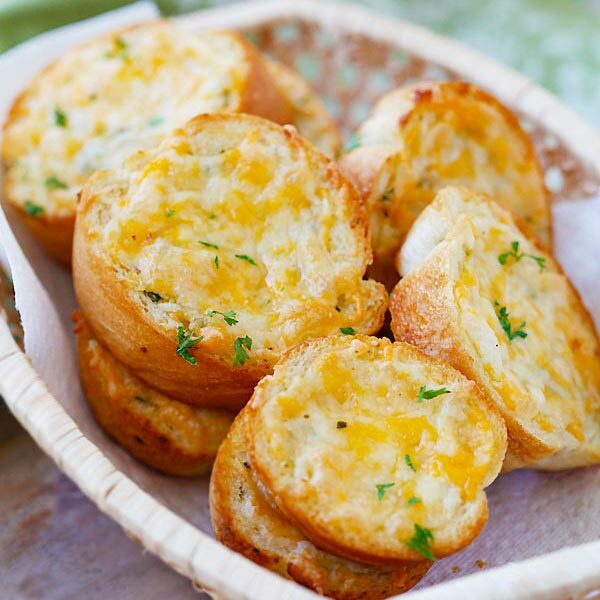 You can make this as a party food (your friends and family will love you for this! ), or as a weeknight or weekend dish. Eat them as is, or best served with crusty French bread or an easy spaghetti. Sop up all the greasy goodness with the bread, and down the shrimp with a glass of cocktail or wine. Life is absolutely delicious! 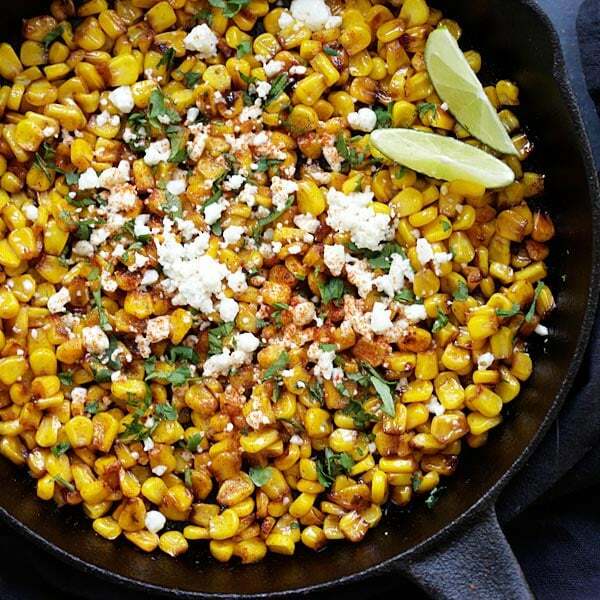 Heat up a skillet with the olive oil on medium heat. Add the garlic and lightly saute. Add the sun-dried tomatoes and the chili flakes, stir to mix well, until the oil becomes slightly red in color. Add shrimp, salt and parsley leaves, stir to combine well. Transfer the shrimp into the oven, roast for 10 minutes. Dish out and serve immediately. This dish is supposed to be greasy. The shrimp should be somewhat soaked in the olive oil. Cut down the amount of olive oil if you want a healthier dish. All photos and recipes on Rasa Malaysia are copyright protected. Please do not use the photos and recipes without prior written permission. 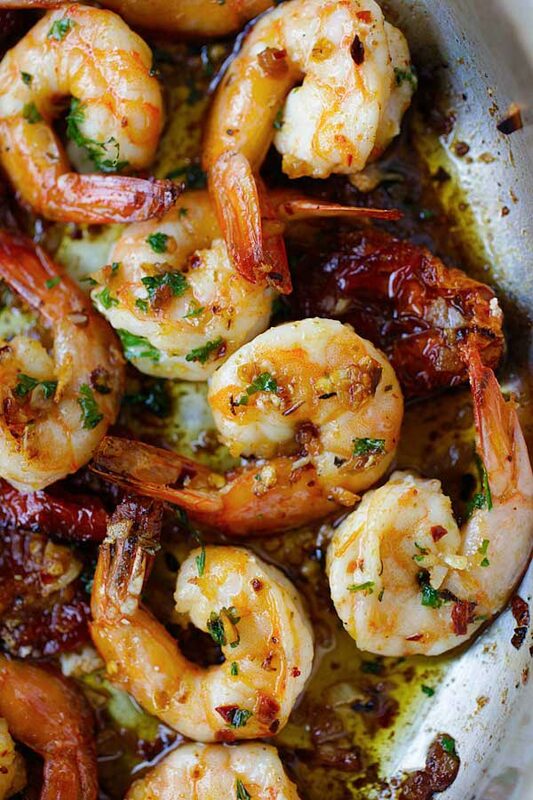 If you wish to republish this recipe, please rewrite the recipe in your own words instead of copy and paste and link back to //rasamalaysia.com/garlic-sun-dried-tomatoes-roasted-shrimp/. Thank you very much! Thanks Lisa for your sweet note. Yes, it is perfect…almost like gambas al ajillo but better I think, because it has sun-dried tomatoes. Sounds delish. But I”m curious. Why do so many recipes leave the tails on the shrimp these days? Does it make the dish more flavorful. I was at a restaurant the other day and ordered a Shrimp and Linguini dish and the Shrimp still had the tails while covered in a beautiful sauce. . Let me tell you that was very irritating eating, having to fork out a sauce covered shrimp, cut the tail off on a separate plate, fork up linguini and add the now tail-less shrimp (gone cold by now.) I heard Gordon Ramsey say once that leaving shrimp shell tails on was only appropriate on Shrimp Cocktail, but chefs leave them on all their dishes now thinking it is somehow gourmet but I don’t know It doesn’t bother me on fried shrimp or finger food shrimp. Just pick it up and bite, but in recipes with sauces? You don’t have to leave the tails on for this recipe. For me it’s the presentation, it looks prettier, also shrimp shells impart additional tastes to the dish, it makes it more briny and delicious. really love this recipe and its marvelous!!! thank you!!! Thanks Anne. Did you try making the shrimp? This was very good! I made this tonight and served it on a bed of brown and wild rice with roasted mixed vegetables seasoned with paprika, chili, salt and pepper. It was so delicious and the sundried tomatoes tied everything together so well. 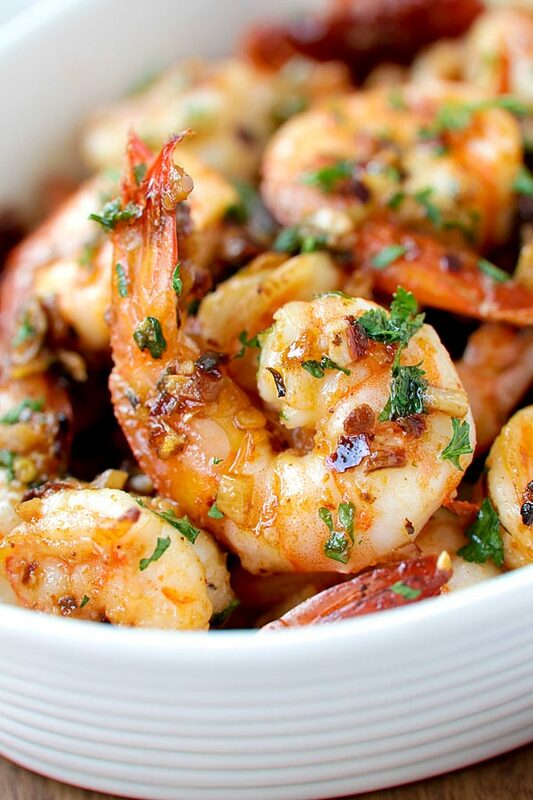 Hi Jordan, thanks for trying my garlic sun-fried tomatoes roasted shrimp recipe! 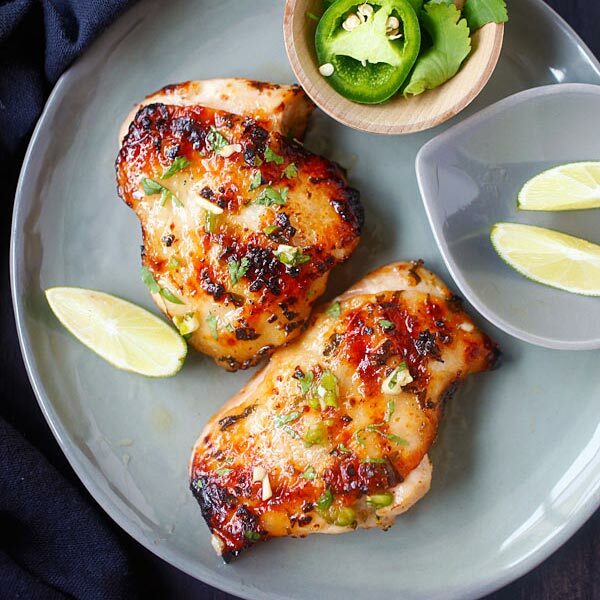 I really want to try this recipe for dinner! Any suggestions on what to fix with the shrimp? I’m not sure if it would go with rice or pasta better. Hi Laura, what do you mean by fix with the shrimp? It will go well with both. I made this for a family get together, and it was an absolute hit. Everyone raved about it. It is now my to go to recipe for shrimp. The only change I made was adding some fresh squeezed lemon juice. Hi Maggie, fresh lemon juice sounds good. Yes, this recipe is absolutely delicious. I tweaked your recipe because I didn’t have sun-dried tomatoes in the house. I used Sun-dried tomato pesto from Aldi. Sauteed the shrimp in olive oil with the garlic, then added the pesto and some fresh parsley. It was absolutely delicious. Hi Lois, sounds very yummy! Do you drain the sundried tomatoes or add the oil they are packed in?